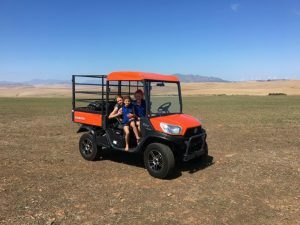 Langhoogte Plase’s Josias le Roux is a no-nonsense grain and sheep farmer in Caledon, Western Cape who makes decisions after careful consideration of what is right for the task at hand. 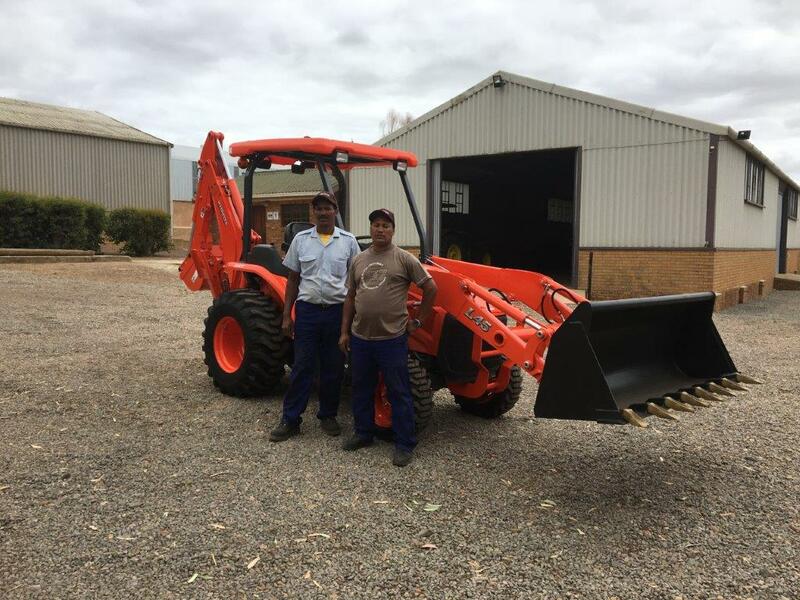 Recently he bought a Kubota RTV-X900 utility vehicle and a Kubota L45 tractor, loader, backhoe (TLB) because “they address my needs and fit my portfolio of implements and machines”. “That’s how I look at things,” says le Roux. 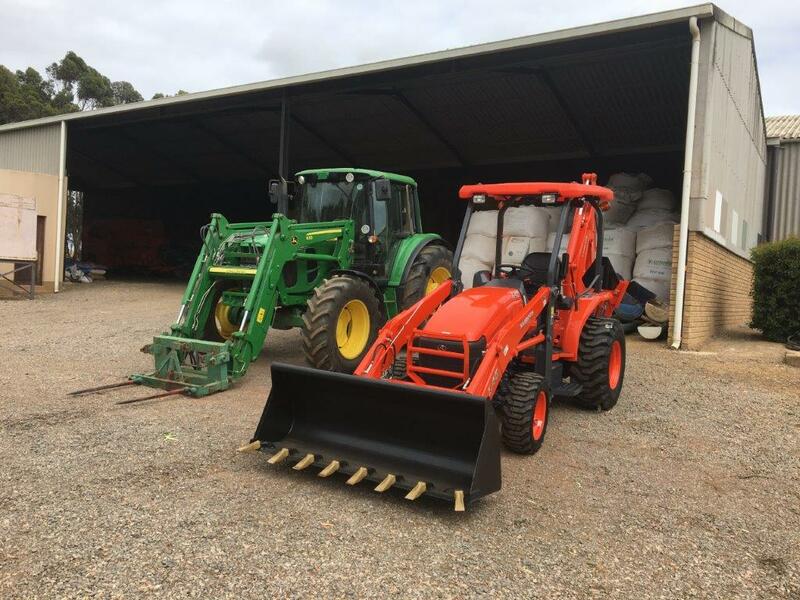 “If I see a machine that is right for a particular application on the farm then I will buy it. 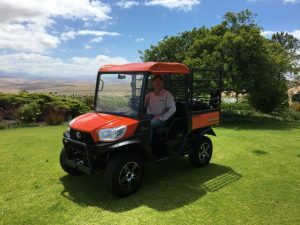 Of course the machine must be a quality product and the backup service world class and I found both these qualities in Kubota,” he says. The Kubota RTV-X900, which le Roux is using specifically for servicing sheep in the process of lambing, is powered by a Kubota 21.6HP, 3-cylinder diesel engine and is renowned worldwide for its durability and exceptional reliability. Supported by a unique Variable Hydro Transmission (VHT-X) and standard 4-wheel drive, the RTV-X900 tackles the toughest terrain with ease, especially when conditions are wet. The loading bin can take a capacity of 500kg which is ideal for loading a tank for fire fighting and weed control. “I am impressed with its power to weight ratio and also how comfortable it is to ride and operate. It has plenty of legroom, a big and clear digital instrument panel and lots of storage capacity,” says le Roux. 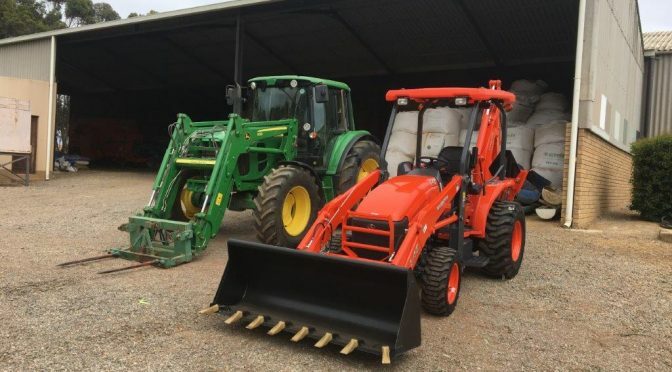 The other machine, the Kubota L45 diesel TLB, which le Roux bought for a host of jobs around his farms including general maintenance, has been one of Kubota’s best-sellers worldwide. It sports the renowned Kubota HST Plus hydrostatic transmission, of which SPE’s Kubota brand manager Deon Engelke says: “with startling precision, this transmission’s automated control of both the HST pump and motor gives optimal performance, regardless of the task, working conditions, or operator expertise”. The backhoe has a 3m digging depth, a high-performance inching valve and an optional hydraulic thumb. Also, the optional quick coupler helps to change buckets in a “snap”. This is the perfect option for those who do a lot of bucket work and frequently change bucket types. Excellent operation, better visibility, and superior versatility are just some of the reasons the L45’s performance-matched front loader is considered unrivalled for power and productivity. With a 1600kg of breakout force, 1000kg of lift capacity and a 2.8m lift-height, these robust loaders have the strength and reach for most projects. An important feature when using the front loader is the slanted boom which matches the L45’s hood and provides operators with a greater field view when changing attachments. 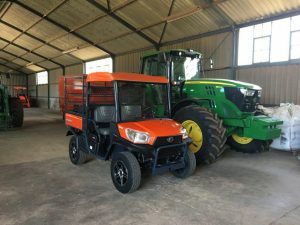 Le Roux says that one of the important reasons he chose the Kubota TLB was that the independent PTO allows you to engage and disengage the rear PTO while the tractor is in motion. “This means there is no need to stop the tractor to engage or disengage the rear PTO ensuring high productivity levels,” he says. “It was a pleasure dealing with Kubota,” says le Roux. “In fact Albert Lombaard is one of the most professional sales people I have ever dealt with. He is knowledgeable, his word is his bond and, importantly for me, he was his sales professionalism. ” concludes le Roux. This article was featured in the HireSA April 2017.